This post doesn’t have anything to do with lions or tigers. Just bears. These bears … The Patchwork Bear. I have seen bears like this before and they are just beautiful. Today, I saw a post on Still Standing about a Patchwork Bear that was made from the clothing and blankets from a baby girl who passed away at five days old. The bear is just precious. I love the little bear on the bottom of one of the paws. 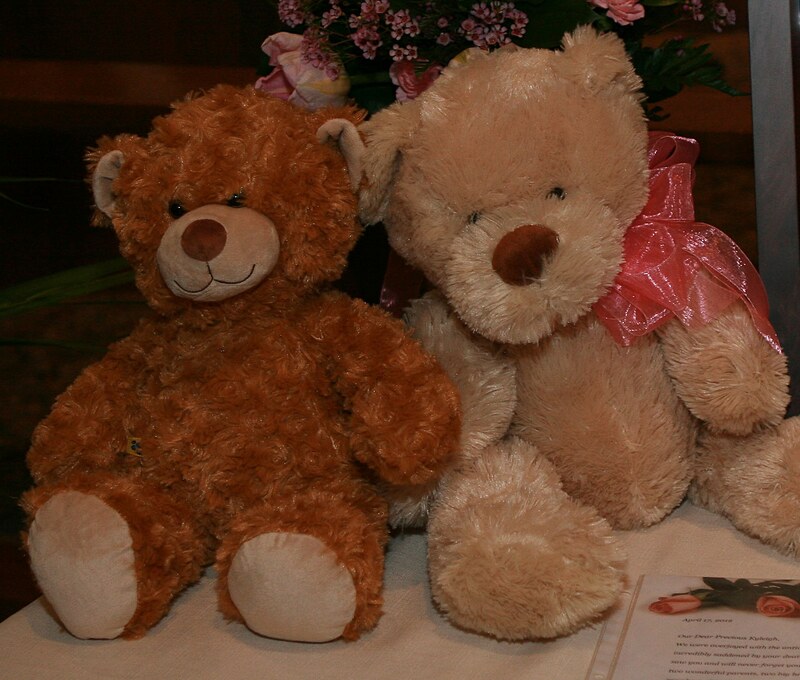 The Patchwork Bear and Still Standing Magazine are holding a giveaway for one of these bears to a baby loss mom. As I went to enter my name, I realized that I don’t have any clothes or blankets to send if I were to win. This makes me sad. It’s really the first time that I have wished for us to have more clothes and blankets for Kyleigh. You see, since we did not know until Kyleigh’s birth that she was a girl, we had not bought hardly any girl stuff. We always buy a boy and girl coming home outfit. That is all we have that was bought specifically for Kyleigh. We have two or three other girl outfits that we bought when we were pregnant with Kyleigh’s brothers, because again, we did not find out gender until birth. But those aren’t Kyleigh’s clothes. Sure, she would have worn them, but they were not purchased specifically for her. The dresser in her room is still full of baby clothes. Boy baby clothes. A few things are gender neutral, but the overall tone is definitely boy. Again, she would have worn some of it, but I do not consider those clothes to be hers. They are her brothers’ clothes that they wore and that someday I will put away. Someday, I will have to decide which of those baby clothes are worthy of a garage sale and which of those baby clothes are too precious to give away. The ones I keep will be from memories of my boys wearing them, not Kyleigh. So why is it so hard to go in her room and pull all the clothes out of the drawers and shove them back in the plastic totes that are stacked floor to ceiling in her closet? To be honest, I haven’t tried it, but know that the clothes are perfectly fine just where they are. Kyleigh does have three blankets. We have the cream colored afghan that she was wrapped in after her death. It is the only blanket that holds her smell. The only blanket that I held her in. Volunteers from the hospital lovingly made it and it is folded up within her memory box. This blanket and a crocheted hat are the only items we have that Kyleigh physically wore that we still have. A second afghan is from Kyleigh’s grandma. She has made afghans for all of her grandchildren and after Kyleigh passed away, I asked Rodger’s mom if I could still have Kyleigh’s blanket. It also is folded up and tucked away in her memory box. The third blanket is a quilt made by my Grandma Nina. Many years ago, Grandma Nina gave my sister and I each a quilt that she had made. I took the blue one and my sister took the pink one. Grandma had made them for what she was hoping was her next great-grandchildren. The blue one that I took became my oldest son’s quilt. The pink one became Kyleigh’s. 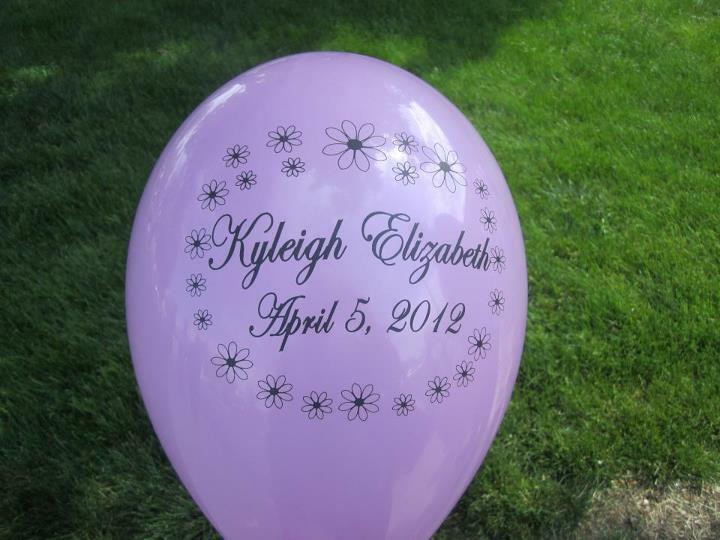 My sister brought it to me one day a few weeks after Kyleigh died and told me that she was saving it for her niece. She wanted me to have it for Kyleigh. Kyleigh was my Grandma Nina’s 15th great-grandchild. I know that Grandma has already made a quilt for Kyleigh in heaven. All three of these blankets hold such special meaning that there is no way I could ever send them off to have them made into something else. There are two other very special blankets for Kyleigh. One is the afghan that she was buried with. It was made by my mother-in-law at the time of her father’s death. It is an afghan that was always very special to our family and only seemed fitting that Kyleigh was buried with it. The other special blanket is a soon to be made quilt by Kyleigh’s Grammy. My mom has made baby quilts for both boys and we once again were waiting to find out boy or girl before she started making a quilt for this baby. We have a pattern picked out and when the time is right, we will go shopping for the fabric. Making a baby quilt for a baby that you don’t get to hold is not an easy task. As I think about the lack of baby clothes and blankets that I have to make a bear, I am reminded that Kyleigh already has a bear. In fact, she has two bears and a bunny. Before she was born, Rodger and I took our boys to Build-A-Bear and let them pick out a stuffed animal to make for their newest sibling. 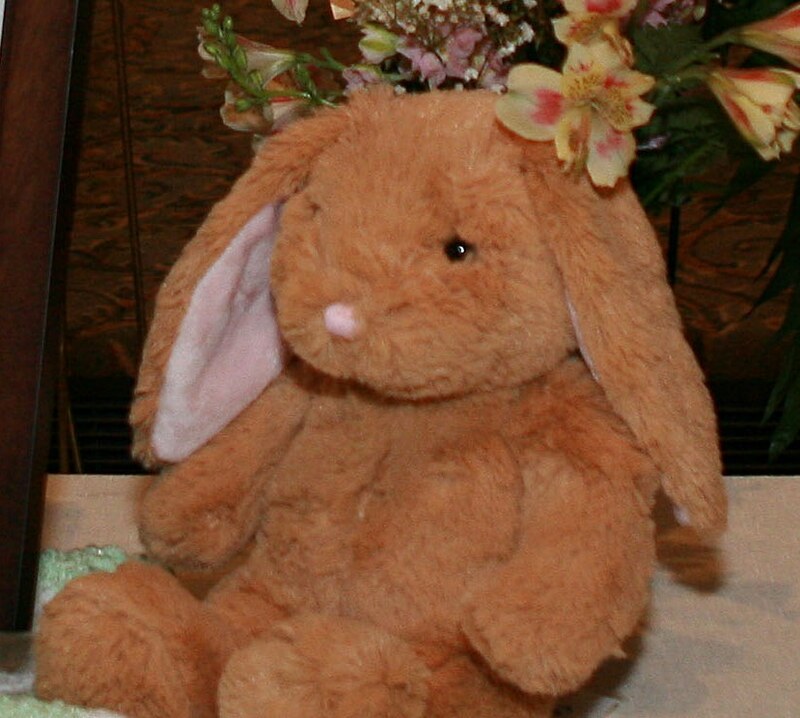 Oliver chose a bear and named it “Oliver.” Garrison chose a bunny and named it “Bunny.” My boys are so original. They had fun going through the process of making the animals and were excited to give them to their new brother or sister. The bear and bunny now sit on a shelf in my closet. Occasionally, the boys will ask to hold the animal that they made. We have told them that those stuffed animals are now theirs, as a memory of their sister, but we still don’t let them play with them for fear of them getting torn up. The other bear that we have for Kyleigh would have been her 1st birthday bear. My parents have gotten both boys stuffed bears for their first birthdays. They LOVE their bears. Garrison often carries his around the house with him and Oliver continues to sleep with his every night. Sleep does not happen if we can’t find Bear! Kyleigh’s Grammy and Pa gave us her bear, tan with a pink bow around its neck, in the days following her death. Kyleigh’s bear sits atop our armoire and is a daily reminder of her and the love that her grandparents have for her. As I look back at the beginning of this post, I was saddened by the fact that I don’t have a closet full of clothes or a drawer full of blankets that are pink and purple and full of flowers. But as I write this, one thought leads to another and I realize that I don’t need a closet full of girl stuff. In fact, I’ve always said I’m glad I don’t. That may sound harsh or odd to some, but dealing with drawers full of baby boy clothes is hard enough. If we had found out that our baby was a girl, we would have bought out the baby girl section at Target and Babies R Us, guaranteed! I can’t imagine coming home with empty arms to a room full of all new pink stuff. What I have realized is that what we have for Kyleigh and of Kyleigh is enough. Everything we have, albeit small in comparison to other babies, is full of memories and sentiments that only we know of. I remember with distinction the day that we took the boys to the mall to buy coming home outfits and stuffed animals. I remember clinging onto the small cream colored afghan during her celebration of life. Because we have so little of Kyleigh’s things, everything we do have means the world to us and no offense to The Patchwork Bear company, but I don’t need another bear. I already have two bears plus a bunny. Disclaimer: If I were to win The Patchwork Bear Giveaway, I will donate my bear to a baby loss mom who has a closet full of clothes, but no bear. I’ve talked before about those nuclear bombs that go off when you least expect it. Well, tonight it seems those are shared by the youngest in our family as well. After prayers, Garrison started crying as if he was in pain. The sort of cry we hear we he falls & scrapes his knee or stumbles on the steps. He’s 3 & quite the bruiser so he’s used to a good deal of punishment, but this was different. It was the cry of a broken heart. A special & terrible cry that I dread the most. I hate it because there’s nothing I can do about it. Through his tears he asked when Kyleigh would come home. It was at that moment that the bomb went off on Leann & I as well. She held him & we assured him again of the promise that she is with Jesus & that one day, when its our turn to join them, we will see her again. He settled down & is now safely asleep & I pray the Author of our dreams will assure him in a way that only He can. Won’t you pray with me? Summer is officially over in our house. Today, our oldest son started Kindergarten. We all piled in the van at 8:30 this morning and drove the three minutes it takes to get to school. We navigated the hallways and walked him to his classroom. He immediately hung up his bag and made his lunch choice. He got excited when his preschool friend entered the room, but still admitted to being nervous. 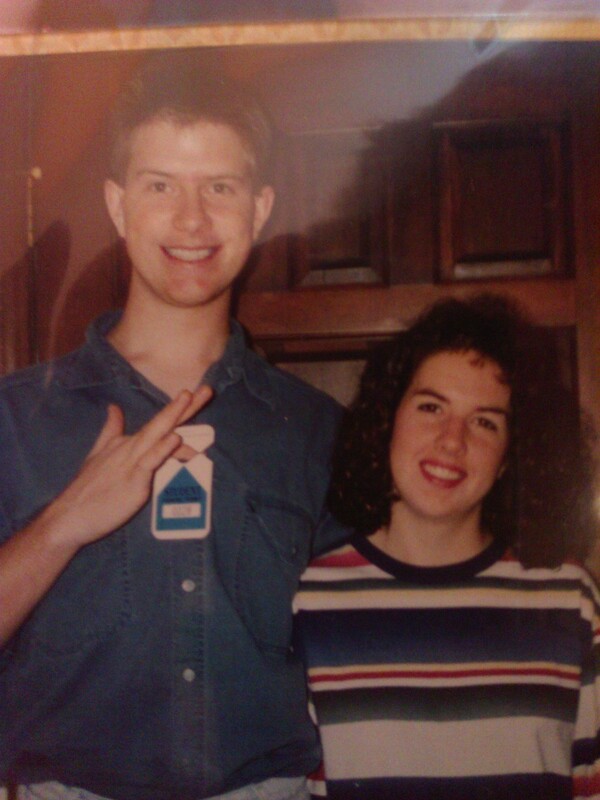 We took a few pictures, said our good-byes and left the room without any tears being shed. I’m not saying the tears weren’t there, we just did a good job of holding them in. As I type this, Oliver is entering his last hour of the school day, while we sit at home and anxiously await his arrival on the bus. Technically, Oliver could have gone to school last year. We made the decision to wait and seeing him this morning only affirmed that we made the decision that was right for our son. I have spoken briefly in other posts about how hard it was to get into a routine this summer. It never got much better. We had a lot of fun this summer, but we also had a lot of difficult days. In mid-June, I was reminded by someone that this was our first summer where it would feel more like summer should. Last summer, we were still deep in grief. It was the end of June when the meals and groceries stopped coming in. I wasn’t cleared to drive until the first few weeks of June. It is a big blur and I remember very little of what we did. My goal was to get through summer and then survive the boys starting preschool. Holding Oliver back a year was the right choice concerning his grief as well. He wasn’t ready to be in a classroom of 20 other students when he was still having hard days himself. This morning, I saw a boy that is ready. He is ready to make new friends, learn more math (his favorite subject) and become more independent (if that’s possible!). We are excited for him and can’t wait to hear about his first day! !